As the summer fast approaches, your AC is subject to increasing wear and tear. No matter how old it is and what condition it’s in, it needs to be well taken care of if you want solid cooling performance and energy efficiency. In today’s post, we’d like to take a look at some things you can do to prevent the need for pro AC repair. We’re here if you need advice on your system, and we offer a comprehensive range of Columbus air conditioning repair service if there’s a problem with the operation of your AC. Call Quality Air Heating and Air Conditioning today! Sign up for a maintenance program: The best thing you can do for your AC is to sign up for maintenance program. During these regular visits, a qualified AC tech will inspect your system thoroughly to ensure that there are no major problems starting to develop. He will also provide a comprehensive cleaning of various major components, including the condenser coils, which are particularly subject to the accumulation of dust and debris due to their location. Lastly, various adjustments to the system will be made on an as-need basis. Speak to your local technician to learn more about how you can improve your AC with a cost-effective maintenance program. Clean and replace your air filter: The air filter is responsible for ensuring that your sensitive mechanical components are not inhibited by dust, pollen, and other debris during operation. This can reduce system longevity, performance, and energy efficiency. However, the filter itself can be problematic if it is neglected. It should be cleaned or replaced about once a month during the cooling season. Keep the outdoor unit free of plants: Don’t let hedges, shrubs, leaves, twigs, and branches get in the way of your air conditioning. It’s critical that you keep the area surrounding the outdoor unit free so that it can adequately dissipate thermal energy. 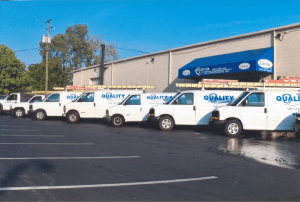 Call Quality Air Heating and Air Conditioning today for comprehensive Columbus air conditioning repair, as well as maintenance services.